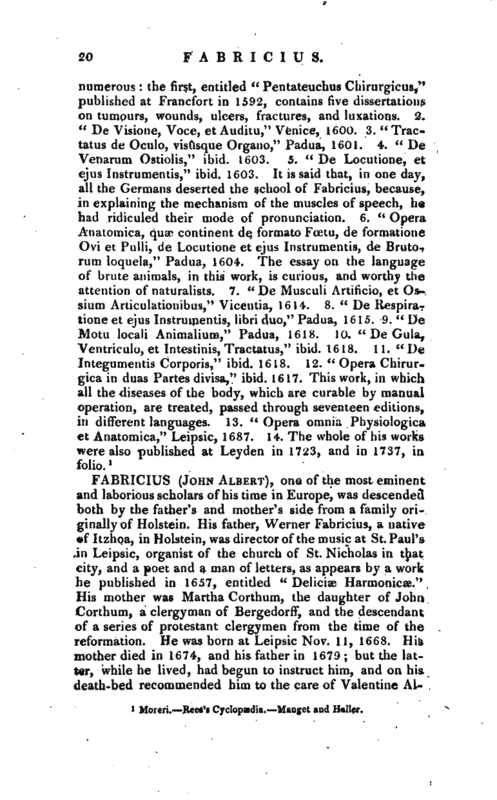 , more generally known by the name of Hieronymus Fabricius Ab Aquapendente, was | born at Aquapendente, in the territory of Orvieto, in Italy, in 1537. 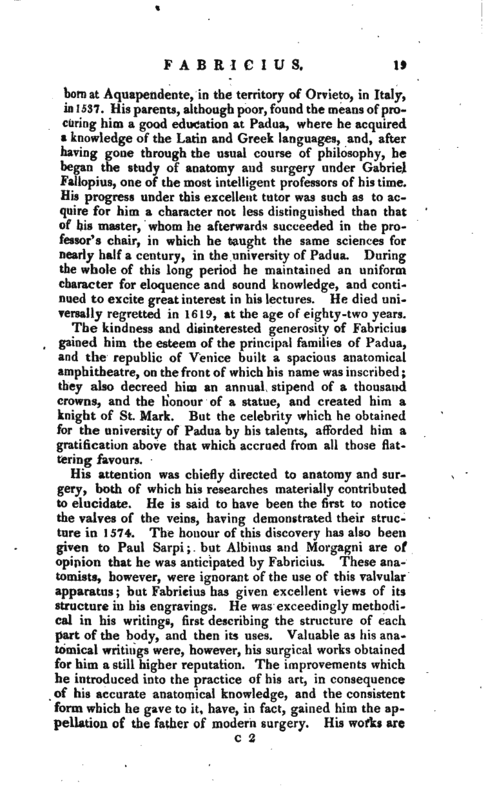 His parents, although poor, found the means of procuring him a good education at Padua, where he acquired a knowledge of the Latin and Greek languages, and, after having gone through the usual course of philosophy, he began the study of anatomy and surgery under Gabriel Fallopius, one of the most intelligent professors of his time. His progress under this excellent tutor was such as to acquire for him a character not less distinguished than that of his master, whom he afterwards succeeded in the professor’s chair, in which he taught the same sciences for nearly half a century, in the university of Padua. During the whole of this long period he maintained an uniform character for eloquence and sound knowledge, and continued to excite great interest in his lectures. He died universally regretted in 1619, at the age of eighty-two years. The kindness and disinterested generosity of Fabricius gained him the esteem of the principal families of Padua, and the republic of Venice built a spacious anatomical amphitheatre, on the front of which his name was inscribed; they also decreed him an annual stipend of a thousand crowns, and the honour of a statue, and created him a knight of St. Mark. 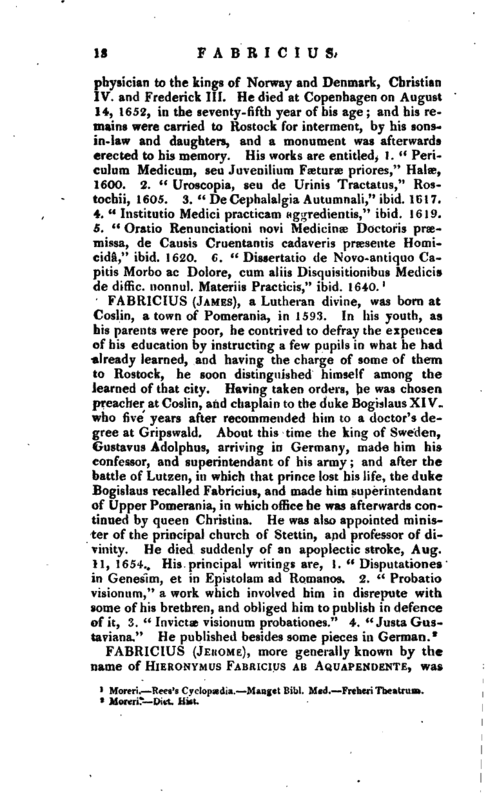 But the celebrity which he obtained for the university of Padua by his talents, afforded him a gratification above that which accrued from all those flattering favours. Moreri. Rees’s Cyclopædia. -—Manget and —Haller.